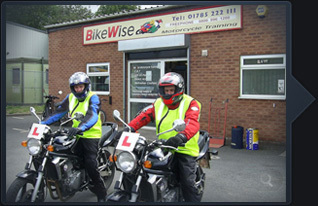 Why choose BikeWise for your CBT Shrewsbury course? You are in Shrewsbury and your closest motorcycle training school is BikeWise in Shrewsbury or select another school by clicking below. To ensure you know were we are, you will find a location map and directions on how to get to us below (click to scroll down). You can find a BikeWise School to take your CBT Training in three of the largest towns in the West Midlands. Madeley, Market Drayton, Much Wenlock, Nesscliffe, Newport, Oswestry, Overton, Shifnal, Shrewsbury, Telford, Wellington, Welshampton, Weston, Whitchurch, Worthen, Wroxeter, and more.